It’s that time of year again, babes! Time to prep your submissions for the fifth edition of our zine! As always we accept all mediums for submissions ~ email your best stuff to high@womenweedwifi.com by March 3. See below for inspirational fliers and a little about this issue’s theme. Please email us with any questions or clarifications regarding submissions… happy creating! Calling the International Girl Gang! This issue is for any womxn/femmes of color who grew up watching their parents send money via Western Union to family in the homeland and making long distance calls with international calling cards. For girls who switch between codes and languages, girls who message their family on WhatsApp. Girls who were told they had difficult names to pronounce. Girls who collect stamps in their passport, girls who dream of a faraway (or nearby) land, still have foreign currency in their wallets. Girls who have had international flings, keep coming home to something nowhere else has. How much foreign weed have you smoked? Indigenous girls everywhere rep your tribe and your clan, your corner of the earth. We want as many different stories as possible represented, want to see where everyone is from. Tell us your story in any medium available to you ~ email all submissions to high@womenweedwifi.com by March 3, 2019! It is that time again--- we are putting together another zine and we want YOUR art!! 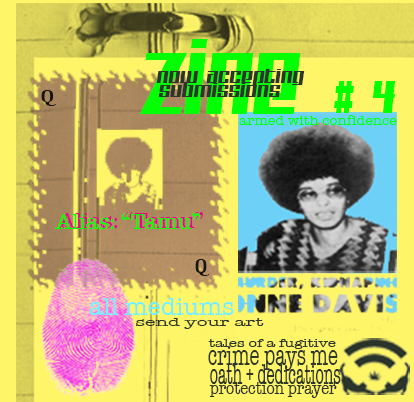 Send us pieces of all mediums: poetry, photography, collage, illustrations, video, playlists, mugshots, etc. etc. Peep the promo fliers and read a little more about this issue's themes below. Email all submissions to high@womenweedwifi.com by Feb 1, 2018!!!! Free Leonard Peltier, Mumia and all Political Prisoners! My Cousin Gets Out in the Spring! This issue of the zine is for womxn who find their spiritual laws at odds with those of man; For those that dress up for court dates or who've ever said goodbye to an incarcerated parent or loved one. This is for those who pray for protection from the law and do whatever they want, for those who steal when they have to, and those who have permanently lost someone to the system or the hu$tle. For anyone that has previously been persecuted for weed...or if you've never been caught...We wanna know, is hustling in your blood? Would you do it again (are you still at it?)??? Did you ever think it was all over, but somehow you escaped? Is your passion illegal? WE WANT TO HEAR FROM YOU!!! It's that time again! Women.Weed.WiFi is putting together our third zine and we want YOU to submit. The theme is "Once Upon A Lit Time" and we are looking for reflections, confessions, blackmail, prayers, and laments about times that changed you or your world. Light one up, filter through your notebooks, get to drawing, photographing, collaging, filming etc and send your final submission to high@womenweedwifi.com. Accepting submissions now til the new year xo Good luck! Last night at Moksha Seattle we celebrated the release of the first issue of our zine. "Say Perhaps to Sobriety" is a collection of photographs, writing, and collage from contributors from around the globe. centering around the questions and emotions associated with sobriety and inebriation. If you missed the event last night featuring performances by Astro King, Zelli, DJ Toya B and more, no worries, you can still cop a zine in our shop.